The 10.5-inch iPad Air (2019) is almost the 10.5-inch iPad Pro (2017), minus a few features and for a much lower price. The last time Apple introduced a new iPad Air was 2014. Since then, there have been iPad Pros with more premium features and price tags, and even a resurrected, unbranded original Air (now known as the 9.7-inch iPad) with the lowest entry-level price ever. But as the Pros got more expensive and the base model less, there's been nothing but a widening gulf in-between those two extremes. Until now. Don't want to read? Hit play to watch the video version. 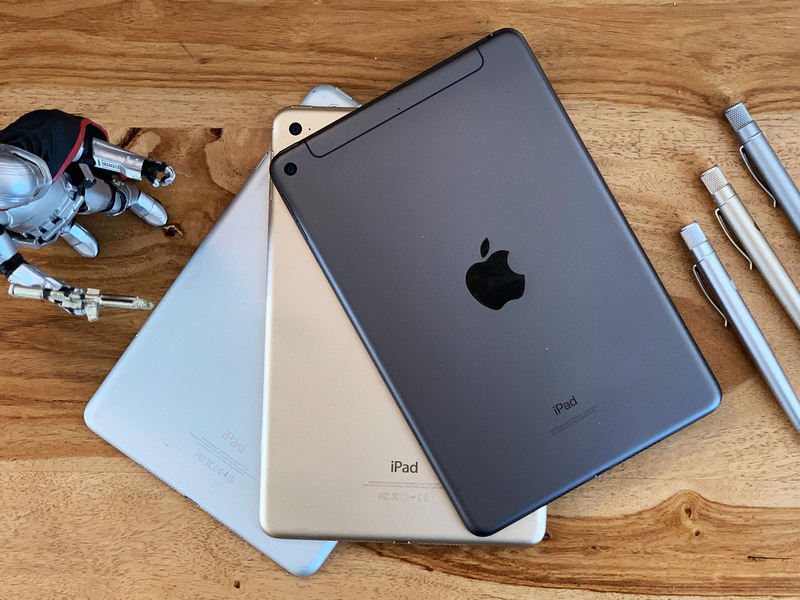 So, with the 2019 iPad Air 3 and the almost identically specced iPad mini 5, Apple hasn't just launched new iPads — they've launched a new midrange tier to the lineup, something with many of the Pro features but without the pro price. I spent some time chatting with Apple about the new iPad Air 3 in New York City last week and picked one up one for review while in Cupertino for the Show Time event. But, I wanted to do a wider, more complete, more in-context review for the Air as well... In the air. Literally. I scored an upgrade on my flight home, headed to the airport, jumped into one of the wacky s-shaped pod seats, and got to work finding out what this new 10.5-inch Air is really all about. Note: If you can find it on clearance sale, strongly consider the just-discontinued 10.5-inch 2017 iPad Pro 2, which is almost identical, but has 4 speakers, a 120hz ProMotiion display, and better rear cameras. The iPad Air 3 (2019) may cost the same as the original iPad, but it brings an almost full-on, pro-level feature set with it for that price. That makes it the new everyday iPad for just about everyone. The iPad Air 3 is bigger than the 9.7-inch Air 2, though. Apple didn't quite take it to 11 like the 2018 Pro, but it gets pretty close: 10.5-inches, just like the 2017 Pro. That makes typing, which was already good, about as great as it is on a laptop. Maybe a little worse if you hate the fabric keys... maybe a little better if you hate the butterflies. I worked on a 10.5-inch Pro a lot, and I loved it, and not surprisingly I love this as well. It fits on tray tables, sure giant ones like these, but also the super cramped, downright hostile ones — looking at you, last Delta flight. It might be a little much for kids to use one-handed, but as a two or even one-and-a-half-hander, it works great. Even better on laps and flat surfaces. 7.9-inch iPad mini vs. 10.5-inch iPad Pro (which is identical from the front to the 10.5-inch iPad Air 3). The mini may be the ultimate in ultra-portable digital field notes with cloud sync, but the new Air, at this size, is like the ultimate everyday digital notebook. It's not the huge canvas — or carry! — of the 12.9-inch but it has more than enough room for all your sketches, diagrams, notes, apps, books, games, and more. Back in October of last year, Apple didn't just bring the rounded iPhone XR display design to the iPad Pro. They brought back a lot of the squared-off iPhone 4 and iPhone 5 design language as well to make something retro modern and all shades of badass. With bezels that were shoved so far back the Home button popped off and an overall look that made all the older iPads instantly look… older. So, to have new iPads come out with that old design language can seem a bit... strange. 11-inch iPad Pro with 2nd generation Smart Keyboard vs. 10.5-inch iPad Air 3 with the 1st generation Smart Keyboard. Bezels are the same. I'm totally in the, "delete them all and let Jony Ive figure it out" camp, but I know some people who also just love a little something extra to hold onto. With ebooks, it's not so big a deal but with comic books, I reluctantly admit it's nice not to have your giant, 'It's clobbering time mitt' obscure the art. Also, as I said in my iPad mini review, every time I get that cockamamie "camera covered" warning on the latest generation iPad Pros, because I mostly use it in landscape and Face ID ain't on top like that, chief, I sympathize with them. So. Much. Bottom line, Apple is saving the fancier features for the iPads with the fancier price tags. That includes the four speakers that adjust the sound with the iPad orientation. Air 3 stick to two… which rotate the sound with the iPad, and which aren't anywhere nearly as good. Likewise the Lightning port instead of USB-C. Again, as I said in my iPad mini review, for some people, especially those with tons of Lightning accessories already, that's probably a benefit. For nerds like me who just want to plug everything into the same port, not so much. On the flip side... Like, if you flip it over and look at the top side, you get something the fancy new iPads Pro don't get: A 3.5mm headphone jack. I've long since moved on to AirPods for freedom and convenience, and others now revel in the higher quality that can come from Lightning. But, for people who just want their old iPhones to work with good old jacks, or people with audio accessibility needs that find it way easier to charge and listen at the same time this way, this time, you win. And, yeah, you also get the gold finish option Apple now feels is way too much fun for pro users, even the smaller ones. While I'd love the mini in every shade of iPhone XR and more, I'm pretty ok with the Air being offered just this way. One of the ways Apple cut costs on the 9.7-inch entry-level iPad was by cutting the laminated screen that was in the then-previous iPad Air 2 and going back to the non-laminated screen of the original iPad Air. Again, it's not something everyone notices all the time but, if you're in bad indoor or bright outdoor lighting, you tend to notice. With the new 10.5-inch iPad Air 3, the lamination is back as well as the anti-glare coating, so it's about as non-reflective as an iPad can get. New to the Air is DCI-P3 wide gamut color, so your greens look ultimate Widow gore-green and your reds look ultimate Cap raging red. Apple's not calling these displays HDR or claiming they can display HDR content. They can play it back, but the LCDs just aren't capable of the same inky blacks or peak brightness as OLED displays. So what you get is more of an extended range, in other words, the best they can do. And, yeah, sure, not everyone appreciates wide color, but if you're painting on your iPad or working with photos, it looks so good it's hard to go back to plain old sRGB. If you want a Dolby Vision experience, Apple offers the much smaller iPhone XS Max or the Apple TV 4K, which you can plug into any OLED your heart and eyes desire. There are some OLED tablets out there, like the new Samsung Tabs, but last I heard, for the amount Apple wants to make, and what they want to do with them, the current gen of OLED still isn't practical or consistent enough. Still, watching videos looks great. Animation pops just like you'd expect, and even Apple's TV+ sizzle reel... you guessed it... sizzles. What the new Air 3 doesn't get that, not only the current, but even the previous 10.5-inch Pro had is Apple's 120hz ProMotion on either. Yup, that smoldering smooth refresh rate didn't survive the price cut. But, True Tone did. That's what Apple calls dynamically adjusting the display to match the color temperature of the world around you, keeping white white. Not blue-white or yellow-white but crispy, paper white. You may want to turn it off if you're in a studio doing color correction but otherwise turn it on and leave it on. So here's where things get interesting. The 10.5-inch iPad Air 3 may look almost the same as the 10.5-inch iPad Pro 2, but... wait for it... it's bigger on the inside. Instead of an A10X Fusion, which had three sets of paired efficiency and performance cores quote-unquote fused together, the new Air backs Apple's latest A12 Bionic, which has four efficiency and two performance cores that, thanks to a new controller, can all work separately or all assemble, Avengers-like, together. It's lightyears — okay, four years — ahead of the A8X in the previous iPad Air. But, while it's the latest, it's not technically the greatest. Because like the iPhones XR and XS, it has the regular A12... not the A12X of the current iPads Pro. That adds two additional performance cores and three extra graphics cores, bringing that total to 7. It also has less memory. 3GB instead of 4GB (or 6GB in the 1TB version) to be precise. It does have the same new Neural Engine, which means even though it doesn't use it for Face ID, because no True Depth camera system, it does use it for everything else involving machine learning and computer vision, including photo enhancement, to photo sorting, to all the heavy lifting all those crazy CoreML apps do every day. And it works with the new image signal processor to get more out of the cameras than the sensors themselves could possibly achieve. Now, most people won't care about most of this. What they'll care about is that games fly at 60fps, real estate apps recommend the best photos for their listings so fast they don't even realize they're being recommended, and, hey, I can actually see the sky and the screen in that photo! But, what's more, A12 has enough overhead to make sure iOS upgrades and new apps keep flying on it for four or five years to come. If you're more concerned about the present, about today, then you get the same base level 10 hours of battery life that Apple's been targeting for iPads for years now. They don't really increase it often if ever, but they add new features, and many times reduce weight, balancing capacity and efficiency, to maintain it. So you can do more for the same amount of time. And that includes doing a ton of goofy review stuff from the time I left my hotel to the time I got off the plane. Apple's usually on the conservative side of its battery metrics, but I'll keep hammering on the Air 3 for a month or so to see how it does. Wi-Fi hasn't changed — it's still 866Mbps MIMO. LTE — Yeah, LTE, 5G still isn't a thing — is gigabit now, and with both a real SIM and an eSIM, you can stick in a card for your day-to-day and sign up for roaming plans when and if you travel. That is, if you get the cellular version, which I always do because I just don't trust airport, coffee shop, even hotel, and other quote-unquote free Wi-Fi, and I can use it as an incredibly long lasting hotspot for everything else I own, even and especially while traveling. That's how I downloaded everything onto this iPad, from the hotel and the Lyft, and the airport, prior to taking off. About the only area where the new iPad Air 3 falls short for me, and I mentioned this in my iPad mini 5 review as well, is the rear camera. Not the front camera which is a new 7 MP 1080p model that might not be True Depth like the Pro, which means no Animoji or Memoji, but is still great for Selfies, groupies, FaceTime, and FaceTime groups. But the rear camera. The rear camera, which is stuck at 8 MP f/2.4 and 1080p, just feels so yesterday. Like I said before, the A12 image signal processor, tied into the neural engine, mitigates that somewhat thanks to Smart HDR and all the other near real-time processing it does, but it's always going to be limited by the glass. A lot of you keep telling me you don't care. You have phones to take photos with. And, honestly, good for you. But I see a lot of people taking photos with iPads, even after all the fun everyone's made of them, and if the iPad camera is their primary camera, I want it to be all that it can be. But, sure, these don't require a camera bump and a lot of people prefer that, and they work fine for scanning documents and doing other kinds of businessy work. They also work terrifically well for AR, thanks to all the optimizations Apple has done for that. Seriously, you can lose track of which objects are real and which are models sometimes, and that's terrific scary. If you look at the iPad Air 3 as the new 10.5-inch iPad Air, then it has two new and really important accessories to talk about. But, if you look at it as a slightly stripped down 10.5-inch iPad Pro, well, then, it has two very important accessories that didn't get stripped and are still very much worth talking about. One is the Apple Pencil. The first generation pencil, not the second. That's because, with the older iPad design, there's no way to pair or charge with the second generation pencil. Not without switching to the new iPad design, which — follow along if you got this at home — you can go pick up any time you want at its pro price tag. So, previous design gets previous Pencil. Which means, yes, you're left changing via Lightning, yes like an animal, which is fast and convenient because you can top it up right on the iPad itself… even if it's absolutely as awkward as it looks. The Pencil itself still works terrifically well. It doesn't have the tap-to-change-tools feature, but it has the accuracy, the feel, the angle, the shading, everything else that makes Apple Pencil really quite something else. I mostly use it to draw but it works just as well for note taking, slide making, and almost like a mouse pointer for anything that you want to get your fingers out of the way from the screen for, and just be really precise with. Two is the Smart Keyboard. Also first-generation, not second. But also, I still kinda like it better. Yes, it's like origami, but you can fold it up in multiple ways and you don't have to feel the keys on the backs of your fingers. It's also sealed from debris and it's water resistant, which is great for a travel computer. They do come separately, they do carry an additional cost, but as I sit tens of thousands of feet in the air, drawing and typing, they feel like inextricable parts of the experience. The new, 3rd generation, iPad Air starts at $499. That's the same price as the original and, looking back over the last nine years, it's interesting to see how the product has evolved. More precisely, how it's grown. Back then, if you wanted an iPad, there was only one to get. Now, you have a full range of options. I know that might sound confusing but it really isn't. If you already have an iPad Pro, any iPad Pro, including the 2017 10.5-inch model, you really don't need to look at the new Air. Maybe if you have the original 2015 12.9-inch and you've been itching for something smaller and faster, but otherwise, you're good. If you have an older non-Pro iPad, though, or you're brand new to iPad, I'd argue, strongly, that the new Air should be your go to. If it's just too expensive, then, by all means, look at the 9.7-inch entry-level model. It doesn't have the laminated screen, the A12, or the Smart Keyboard, but it has Apple Pencil support and it's an amazing value starting at just $329. If you really want or need pro features like quad speakers, USB-C, the TrueDepth camera with FaceID, 12mp, 4K rear cameras, and that beastly A12X chipset, and performance is more important to you than price, you can get the iPad Pro of the future starting at $799. And, if you want something smaller that you can tuck away into a jacket pocket, and you don't care about the Smart Keyboard, you can get the iPad mini 5, which is identical in every other way, starting at $399. Otherwise, this is the new normal, the new mainstream, the new baseline. The new iPad Air is the new everyday iPad for just about everyone.